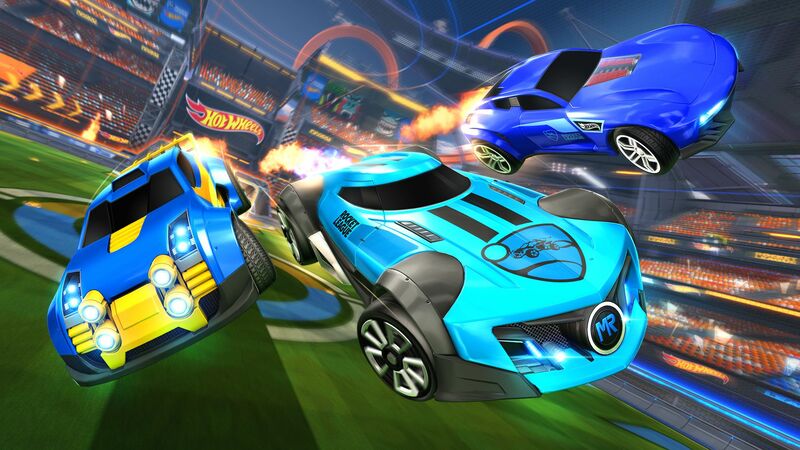 Is the new Rocket League Hot Wheels Triple Threat DLC Pack worth your cash? Rocket League and Psyonix keep the cash cow moving with this latest DLC pack, coming ‘hot’ off the ‘wheels’ of their first Rocket Pass. This pack celebrates the 50th anniversary of Hot Wheels with some brand-new cars based off classic Hot Wheels designs. Coming in priced at £4.79 the Rocket League Hot Wheels Triple Threat Pack offers three new cars which makes this one of the largest bundles available for the game, and also the most expensive. 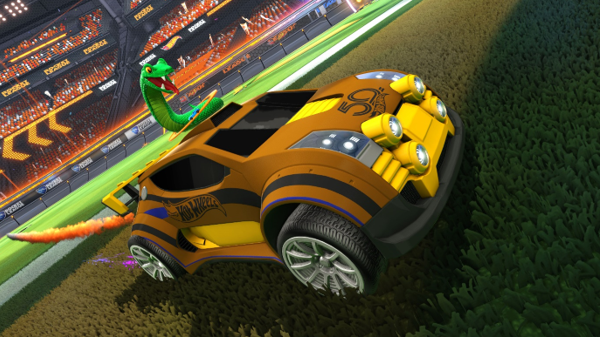 What you get though – along with the three cars – are some exclusive decals, unique wheels and toppers too. It is also worth noting that whilst this premium DLC is coming out, Rocket League is also getting a host of free content as well, separate from both this DLC pack and the Rocket Pass. This includes a brand new Hot Wheels Rivals arena featuring signature Hot Wheels loop tracks at either goal side, and several new customisation items, so those that don’t feel this is worth the price won’t be completely left out. First up in the DLC pack are the three new cars: Gazella GT, MR11 and Fast 4WD. The Gazella and MR11 are both slick looking vehicles with streamlined bodies. The MR11 has a huge front grill, armoured wheels and side plates that will no doubt intimidate those on the other side of the pitch come kickoff. Complete with a curved front window that stretches completely round the sides, this is a car built for both speed and destruction. Fun Fact: This car was actually designed by Marco Reus, the German international footballer. Whilst the Gazella GT shares a similar body shape, this is a much more elegant machine. The front looks like a newer model Mazda MX-5 with a curved front and thin, narrow lights. This is the kind of car that deftly flicks the ball over the keeper with a mid-air pirouette to score, rather than unleashing a 35-yard Thunderbastard. That’s where the Fast 4WD comes in. This design is not too dissimilar to the recent influx of SUVs in the real-world, looking like a brute but also compact and speedy. It has since become my default car when playing online. With six bright lights on the front and an absolutely massive spoiler on the back it quickly became my favourite of the pack. Whilst their shape may certainly look the part, the paint jobs need to match. Thankfully each car comes with four unique decals, many emblazoning the Hot Wheels 50th anniversary proudly on the car. Equally important, are tyres and engine noise. Again, these cars have unique sounds and tyres to really drive these designs home. 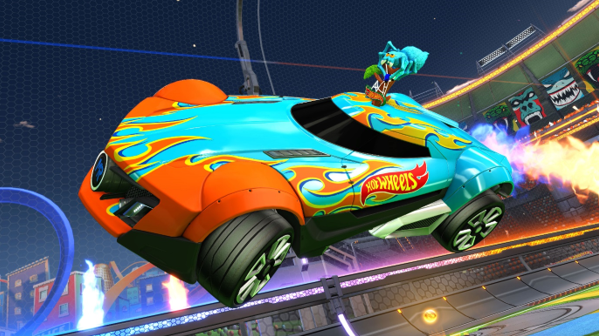 Finally – to ‘top’ things off – are three unique toppers that take their inspiration from classic Hot Wheels playsets. ‘Spider’, ‘Snake’ and ‘Gorilla’ all feature animated toppers that recreate the playsets that put your Hot Wheels cars in peril when you were younger. Gorilla bursts through the roof of your car, Spider spins an intricate web and Snake looks downright menacing while a car circles round them on the iconic orange tracks. There is no question that these new premium cars look the real deal – expect to receive a barrage of messages when you turn up on the field sporting one of these designs asking just where you got it from. My only concern goes to those that have recently forked out for the Rocket Pass to unlock further premium cosmetic items, and now here is another pack priced at £4.79. It would be nice to see just one or the other, or at least a discount on this pack for those that own the Rocket Pass. But for the more casual player that just wants some fancy new cars then having three-in-one for a reasonable price makes more sense. Just watch out when you line up in them against me, I will destroy them! Previous articleIt’s time to embark on a new expedition with Assassin’s Creed Odyssey. Launch trailer included.